We have some essiac articles here. Read as many essiac articles as it takes until you can decide whether essiac tea is right for your situation. F.A.Q. about Essiac Tea An extensive history of essiac, references to essiac research, and the politics of essiac. The National Cancer Institute on Essiac Here is a brief summary of what we know about essiac, and the proposed benefits for those suffering from cancer and other health ailments. Essiac and Your Health Learn which health ailments have anecdotally shown a good response with essiac for some people. We cannot promise that essiac will heal you, but we have seen a positive response in some people who take essiac. The Truth About Cancer Cancer is the second leading cause of death (behind heart disease) in the United States according to the Center for Disease Control and Prevention. The western world spends trillions of dollars each year on conventional cancer treatments with limited results. 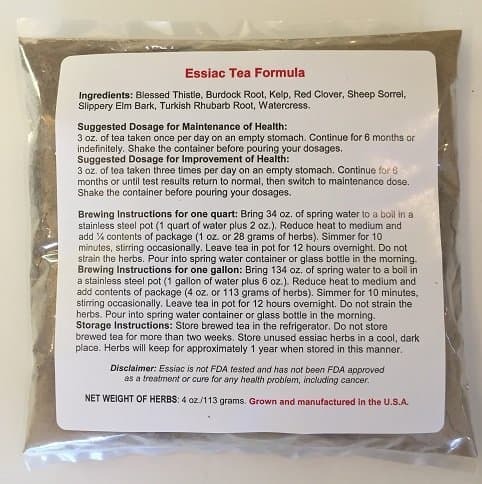 Natural and inexpensive herbs and botanicals such as Essiac tea have great promise to help many who are suffering from cancer and other chronic diseases. If you have additional essiac articles you don't see here, please share them with us!